Jardine's Fajita Seasoning 14 oz. 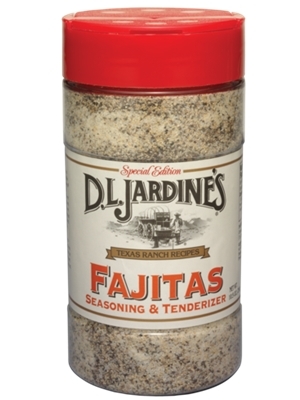 Jardine's Fajita Seasoning is a delicious seasoning that makes fajitas as easy as sprinkle, sit and cook. The result: mouthwatering fajitas! 14oz. Salt, monosodium glutamate (MSG), black pepper, granulated garlic, granulated onion, dextrose, calcium stearate (to prevent caking), and papain (a natural enzyme. ).